Here are the details of jobs bingo. This game is designed to practise the names of jobs and careers. Playing jobs bingo in ESL classes is very simple. Please note: If possible, the game should be played entirely in English - learning the rules and how to play the game, in English, is good practise in itself! Each student is given a bingo card or bingo worksheet containing a different random selection of jobs, and a marker pen (or set of counters). The teacher reads out words from the list in a random order, taking care to pronounce each word as clearly as possible. The students then look for that word on their bingo card or worksheet. If they find it, they cross off that square (or cover it with a counter). Students start off with one square they can mark off without waiting for it to be called out - the "Free Space" square in the middle of the bingo card. The winner is the first student to achieve a winning pattern and call out "Bingo!" (the teacher should check their card at this point). If you want to play a short game: The winning pattern could be any straight line (horizontal, vertical or diagonal) of five marked off squares. If you want to play medium-length game: The winning pattern could be any two intersecting straight lines of five marked off squares. If you want to play a long game: The winning pattern could be to mark off every square on the bingo card. Please note however, if lots of your students are prone to miss matches, you might never get a winner this way! If you have lots of students, and want to have multiple winners: You could have multiple winning patterns - the first winner is the first student to mark off all four corner squares, the second winner is the first student to get a straight line of five marked off squares, the third winner is the first student to get two intersecting lines of five, and the fourth winner is the student who is first to mark off all the squares on their bingo card. Here are some free printables for playing jobs bingo. They include a call sheet (for the teacher to use for bingo calls), and a set of 8 bingo cards to give to the students. Try varying the winning pattern. 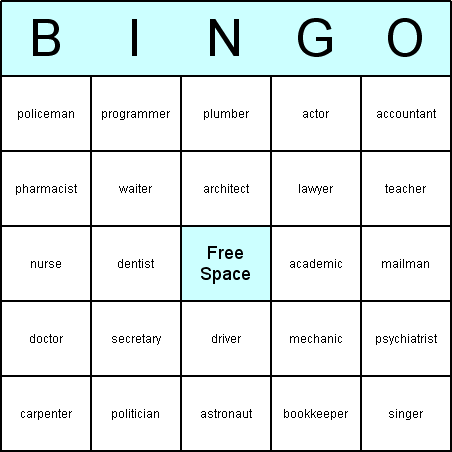 The bingo caller could read out the definitions of each job (example: "a person who delivers letters and mail"), instead of the job printed on the bingo card (in this example, "mailman"). The jobs bingo printables on this web site were produced using the registered version of the Bingo Card Printer software. You could easily make your own bingo games using the same method. Start the Bingo Card Printer. Click New... on the File menu. Choose Blank as the type of new template, then click OK.
To add an item: Type the new item into the field entitled Type your new item here. To remove an item: Select the item (by clicking with the mouse) in the list of items, and then select Delete Item on the Edit menu. To add multiple items quickly: Click Add Multiple Items... on the Edit menu of Bingo Card Printer, and type the items one per line. To copy a list of items from another program (for example, a word processor document): Select and then Copy the items in the word processor or other program (they must be listed one item per line), switch to Bingo Card Printer, and click Add Multiple Items... on the Edit menu, and then paste them into dialog box by right clicking in the text entry area and selecting Paste on the pop-up menu. Optionally: If you want to, you can change the colors and/or fonts for the bingo cards using the Colors... or Fonts... options on the Format menu. Click Print... on the File menu. Change any of printer options if you want to, then click OK to begin printing. Note: To make use of these materials you will need the registered version of the Bingo Card Printer. The materials were prepared using version 3.20 of Bingo Card Printer, so if you have an older version of the software on your computer, please upgrade to the latest version of the software first. You can download the settings file bingo_jobs.bcp by clicking here. Save the file to a folder of your choice on computer. Click Open... on the File menu, then select the file that you saved in step 2, and click OK. The template will now open, and you can use it, modify it, etc., as you wish.